What is with these folks and spiders? There are only a couple of types in the USA which can hurt you, basically the Black/Brown Widow, or the Recluse…Which are fairly rare. They may be ugly – but for the most part they leave people alone. We have this moron, who certainly killed the Spider in question…Along with his car and part of a gas station. When a Michigan driver stopped at a gas station earlier this week, he spotted a spider on his gas tank. In a quick attempt to get rid of the spider, the man burned it with his cigarette lighter which caused his entire car to catch on fire. 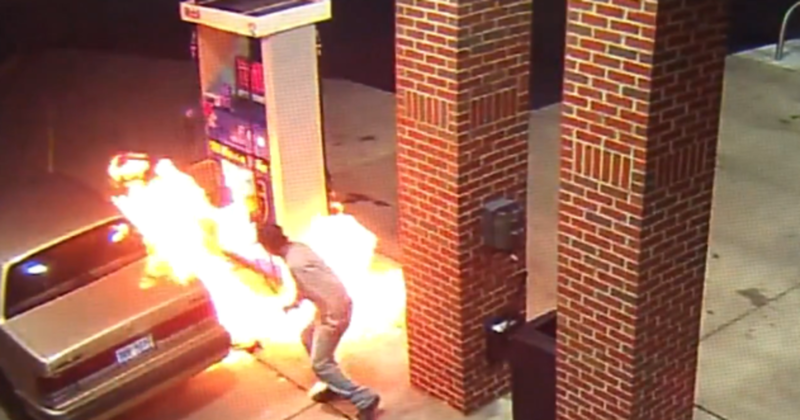 Surveillance video from the Mobil gas station in Center Line shows first the gas pump, then the car becoming engulfed by flames as soon as the man strikes the lighter. Fortunately, nobody was hurt in the incident. Next time this man attempts to get rid of a spider, we suggest a simple shoe drop. Posted by btx3 on September 29, 2015 in Nawwwwww!